In my last post, we saw that finding the spectrum of a signal requires several steps beyond computing the discrete Fourier transform (DFT). These include windowing the signal, taking the magnitude-squared of the DFT, and computing the vector of frequencies. The Matlab function pwelch  performs all these steps, and it also has the option to use DFT averaging to compute the so-called Welch power spectral density estimate [3,4]. In this article, I’ll present some examples to show how to use pwelch. You can also “do it yourself”, i.e. 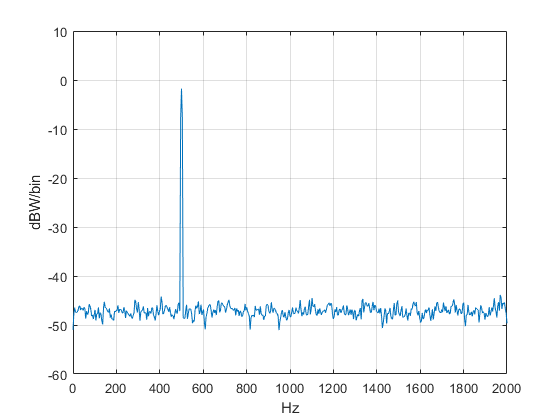 compute spectra using the Matlab fft or other fft function. As examples, the appendix provides two demonstration mfiles; one computes the spectrum without DFT averaging, and the other computes the spectrum with DFT averaging. For this article, we’ll assume x is real. Let length(x) = N. If DFT averaging is not desired, you set nfft equal to N and pwelch takes a single DFT of the windowed vector x. If DFT averaging is desired, you set nfft to a fraction of N and pwelch uses windowed segments of x of length nfft as inputs to the DFT. The |X(k)|2 of the multiple DFT’s are then averaged. The length of the output vectors is nfft/2 + 1 when nfft is even. For example, if nfft= 1024, pxx and f contain 513 samples. pxx has units of W/Hz when x has units of volts and load resistance is one ohm. A= sqrt(2);              % V sine amplitude for P= 1 W into 1 ohm. The power of the sine wave into a 1-ohm load is A2/2 = 1 watt. In the following, examples 1 and 2 compute a single DFT, while example 3 computes multiple DFT’s and averages them. Example 4 calculates C/N0 for the spectrum of Example 3. So we are reassured that the amplitude of the spectrum is correct. This motivates us to try the next example, which displays the spectrum in dBW/bin. We get the spectrum in the bottom plot of Figure 2. The peak power is now less than 0 dBW, because the power is spread over several frequency samples of the window. Nevertheless, this is a more useful window than the rectangular window, which has bad spectral leakage when f0 is not at the center of a bin. For this example, fs, Ts, f0, A, and nfft are the same as for the previous examples, but we use N= 8*nfft time samples of x. pwelch takes the DFT of Navg = 15 overlapping segments of x, each of length nfft, then averages the |X(k)|2 of the DFT’s. 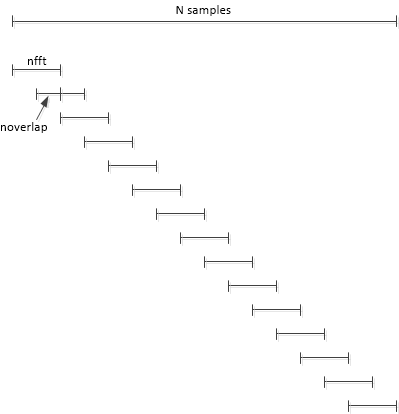 The segments of x are shown in Figure 3, where we have set the number of overlapping samples to nfft/2 = 512. Navg = 2*N/nfft -1 = 15. The resulting spectrum is shown in Figure 4. Compared to the no-averaging case in Figure 2, there is less variation in the noise floor. DFT averaging reduces the variance σ2 of the noise spectrum by a factor of Navg, as long as noverlap is not greater than nfft/2 . Figure 3. Overlapping segments of signal x for N = 8*nfft and noverlap = nfft/2 (50%). Figure 4. Spectrum with Navg = 15 and noverlap= nfft/2= 512. Reducing the noise variance by DFT averaging makes calculation of the noise level and thus carrier-to-noise ratio (C/N) more accurate. Let’s calculate C/N0 for the signal of Example 3, where N0 is the noise power in a 1 Hz bandwidth. First, we’ll find the power of the sinewave (the “C” in C/N0) by performing a peak search on the dBW/bin spectrum, then adding the spectral components near the peak to get the total power. This is necessary because windowing has spread the power over several frequency samples. Figure 5. Left: Spectrum in dBW/bin with marker showing the power of the sinewave. 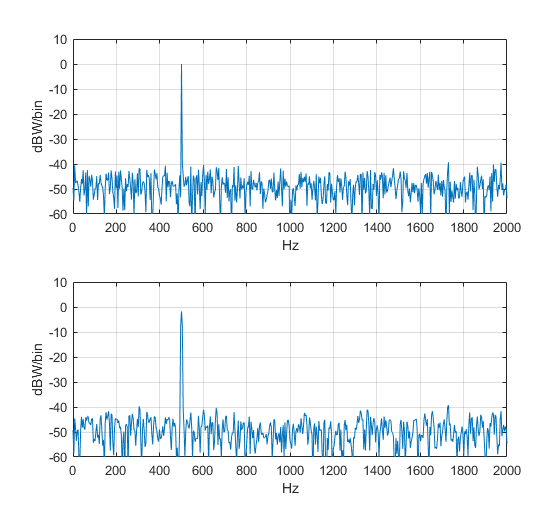 Right: Spectrum in dBW/Hz with marker at 800 Hz showing N0. Figure 6. 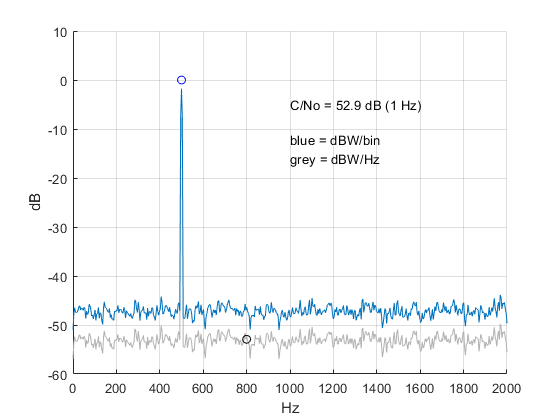 Spectrum in dBW/bin (blue) and dBW/Hz (grey). These examples use the Malab fft function to compute spectra. See my earlier post  for derivations of the formulas for power/bin and normalized window function. % Use FFT to find spectrum of sine + noise in units of dBW/bin and dBW/Hz. A= sqrt(2                        % V sine amplitude for P= 1 W into 1 ohm. Suppose we have segmented a signal x into four segments of length nfft, that could be overlapped. If we window each segment and take its DFT, we have four DFT’s as shown in Table A.1. Here, we have defined M= nfft and we have numbered the FFT bins from 1 to M (instead of 0 to M - 1). Table A.1 DFT’s of four segments of the signal x.
PHz(k) is the Welch power spectral density estimate. Table A.2 Magnitude-square values of Four DFT’s, and their average (right column). The following example m-file uses Navg = 8, summing 8 values of each |X(k)|2 and dividing by 8. For simplicity, noverlap = 0 samples. Another option for averaging, useful for the case where DFT’s are taken continuously, is exponential averaging, which basically runs the |X(k)|2 through a first-order IIR filter . Oppenheim, Alan V. and Shafer, Ronald W., Discrete-Time Signal Processing, Prentice Hall, 1989, pp. 737—742. Lyons, Richard G., Understanding Digital Signal Processing, 2nd Ed., Prentice Hall, 2004, section 3.8. Oppenheim and Shafer, p. 738. Thanks Neil for the very informative article. I'm just wondering at the end where you calculate the SNR, should you have taken the processing gain into account. The noise floor as shown in figure 6 is lowered by the processing gain? In figure 6, the left plot has amplitude units of dBW/bin, and the right plot has amplitude units of dBW/Hz. This is the reason for the difference in noise floor (and difference in carrier level as well). 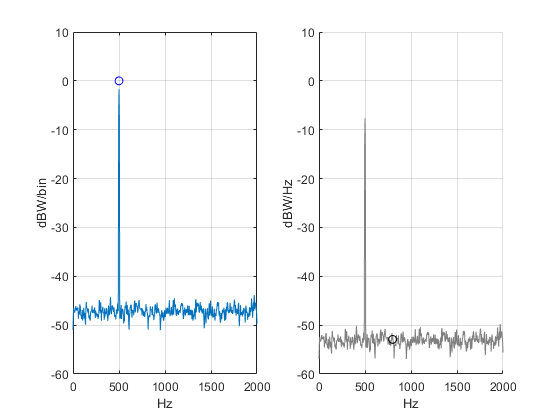 Regarding processing gain due to DFT averaging: If you look at the un-averaged spectrum in Figure 2, and you try to put a marker on the noise, you can get a 20 dB variation of the noise reading depending on exactly where you place the marker. 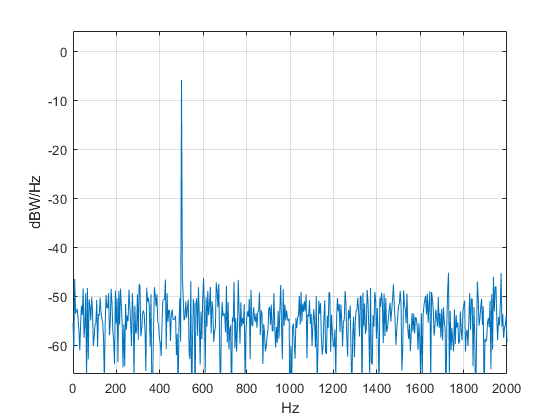 In the averaged spectrum of figure 5 and 6, we have less variation in the noise floor, so maybe only 6 dB variation. You can say processing gain is inherent in the plotted spectrum.